Most people that have seen the new Star Wars movie enjoyed it, but one complaint I’ve seen a lot is that it borrows heavily from the first film, A New Hope. I’ve read that it was intentional, and part of the reason was probably to remind people of how much they loved the original trilogy and help them forget the prequels. And as weird as it may seem, it sort of reminds me of what Red Winter has done with the latest Dungelot sequel, Dungelot: Shattered Lands ($3.99). 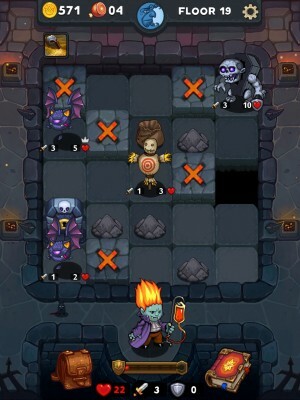 Like the first Star Wars trilogy, Dungelot was widely praised. It was fresh and fun, and it sucked up many hours of my free time when it launched a few years back. Then came Dungelot 2 (Free), and like the second Star Wars trilogy (the prequels), it was kind of a mess. The game had a confusing new free-to-play model, a new art style that nearly everyone hated, and it was rife with bugs. It got so bad, in fact, that the developers ended up pulling the game to rework it and had a second launch a few months later. And now we come to the third game, Shattered Lands. And like the first film of the third Star Wars trilogy, it’s taken a huge step in the right direction by trying to remind people of what they loved about the original. It’s a premium game with no IAPs, a lot less confusing to play, and even has the same charming visual style the first game had. If you never played the first game (or the sequel), the basic idea behind the series is a what if: what if Minesweeper was actually a dungeon crawler? It’s a pretty good way to describe the game, but if you’re a Minesweeper fan the comparison is actually a bit superficial. Each level (or floor) presents you with a board of tiles that must be uncovered in order for you to move on. There’s almost no way to figure out what’s hidden under each one, so at first you just tap in whatever direction you want. Sometimes you’ll uncover enemies, but they don’t immediately end the game like a mine would. Instead you need to either ignore or defeat them, depending on whether or not they are standing in the way of more tiles. Ultimately, your goal is to uncover a golden key which is your ticket deeper into the dungeons. Along the way you’ll also uncover helpful items and skills like bombs, throwing knives, and spells. That’s really just scratching the surface, though, as there are tons of different systems and mechanics in the game that let you play in a variety of different ways. For instance, if you want to power through the game as far as you can, you can try to unlock the weapon that deals the most damage and hop from floor to floor as soon as you find each key. If you want to take things a bit slower and focus on gaining money, however, you can choose a weapon like the pickaxe (which grants you bonus coins) and focus on killing all the enemies on each floor (which will grant you a bonus chest full of even more coins) before moving on. There are a few new things added to the series this time around, like new characters and weapons, brand new mini games that randomly show up between floors, and a mansion where you can buy permanent boosts (like a giant plant that has a 15% chance of eating monsters on each floor). It still feels a heck of a lot like the original Dungelot, though, and that’s definitely not a complaint. We here at Touch Arcade Towers usually try to avoid over-used words like “addictive” when describing games, but it’s actually a great way to describe the series. The basic gameplay loop of exploring and fighting monsters, dying, using your coins to buy better stuff, and then getting even further next time is tuned to near-perfection and just ridiculous amounts of fun. 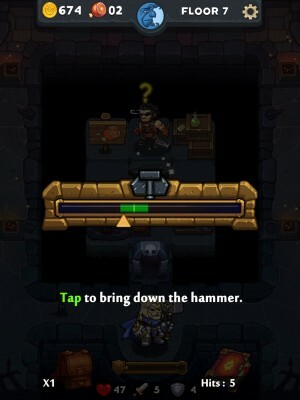 I can imagine some people complaining that the game is too similar to the first Dungelot, but I see that as a good thing. Like The Force Awakens, it tries to bring back everything you loved about the original, while still adding a few things here and there to spice up the formula a bit. In some ways Shattered Lands feels less like a sequel and more like a fulfillment of the promise behind the first game, like this is what Red Winter wanted to make all along. (Maybe that’s why they dropped the “3”?) If you liked the first two games or even if you hated the second (which, admittedly, was greatly improved on its re-release), then you owe it to yourself to try this third installment. Welcome back, Dungelot. What Is CARPET CLEANING SERVICES LOS ANGELES and How Does It Work?